Governor, 1925-1929, Assistant Secretary of the United States Treasury, 1920-1921. Home is 1 mile south, grave 100 yards N.W. 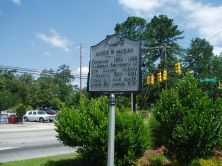 In addition to his legal pursuits McLean was among Lumberton’s leading businessmen, involved with the founding of the town’s first bank, three textile mills, and the Virginia and Carolina Railroad, which he served as president. Long active in the Democratic Party McLean served on the state executive committee and as a delegate to national conventions. 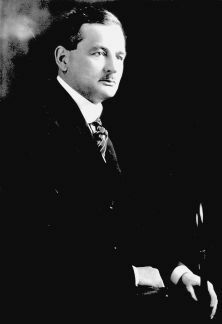 In 1919 President Woodrow Wilson appointed him one of four directors of the War Finance Corporation; in 1920 the President named him Assistant Secretary of the Treasury. 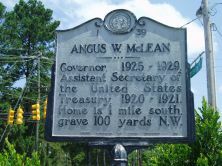 McLean, with the support of the political machine of Senator Furnifold Simmons, defeated Josiah W. Bailey for the Democratic gubernatorial nomination in 1924 and in the fall easily defeated Republican Isaac M. Meekins. In his inaugural address McLean recommended thorough revision of the budget system for state government. A month later the legislature adopted his plan making the governor the head of the Advisory Budget Bureau in charge of preparing a biennial budget. The Department of Revenue was created during McLean’s term. A daily deposit system enacted by the legislature required the direct deposit of all state funds in order to reap the maximum interest. In his campaign against with Bailey and Meekins, attention had been drawn to the bonded debt accumulated under Governor Cameron Morrison. With conservative management of the revenue, McLean concluded his term with a $2 1/2 million surplus, a cushion which would aid his successor during the Depression.